By Norman Chan on May 11, 2015 at 4 p.m.
More like an RC bat. I've gotten a few questions about this small RC bird since sharing it on the podcast last week, so I wanted to share some thoughts from testing it that you should know before rushing out and buying your own. The Indiegogo funded Bionic Bird was something I first learned about at this year's CES, after seeing (and hearing) it fly around by the company's booth. It's the invention of Edwin Van Ruymbeke, who's the son of Tim Bird toy inventor G de Ruymbeke. And in function, the Bionic Bird is very similar to the Tim Bird ornithopter popularized in the 70s and 80s. An ornithopter is an aircraft that flies by flapping wings--a very basic example of biomimicry. 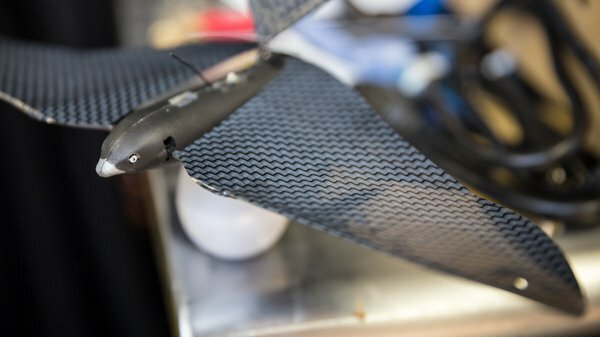 That design yields flight characteristics that are advantageous for small flying devices--the ability to take off without a lot of power, and to stay for long periods in the air by gliding. The Bionic Bird builds on the principles introduced in the Tim Bird, except it has a built-in battery for motorized flight and a radio for directional control (through wing deformation). Looking closer, the Bionic Bird is actually just a tweaking of the $120 Avitron V2.0 RC ornithopter released by Ruymbeke's company in 2012. The primary difference is that Bionic Bird is controlled via a smartphone over Bluetooth, and the Avitron comes with its own dedicated transmitter. For most people, the Avitron is the simplest solution for an RC ornithopter. But setting up and flying the Bionic Bird is simple as well. No assembly is required, and the device comes with a pair of replacement wings. 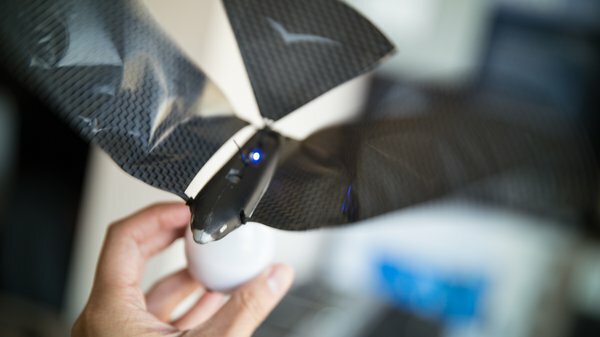 The onboard battery is charged by placing the bird on top of a magnetic charging "egg", which itself houses a small battery and a power port for USB charging. That's so you can recharge the bird in the field after draining its battery. The company claims eight minutes of flight time, but that's with a balance of flapping and gliding. 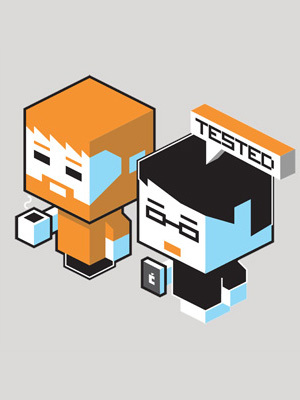 In my sessions, I rarely got past five total minutes of use with frequent crashes and relaunches. Fortunately, the egg holds enough power for up to 10 recharges, each taking about 12 minutes. There's no much to configure on the bird itself. The wing can be pivoted down into preset notches for faster flights, but I preferred a gentle speed to get the hang of flapping and gliding. 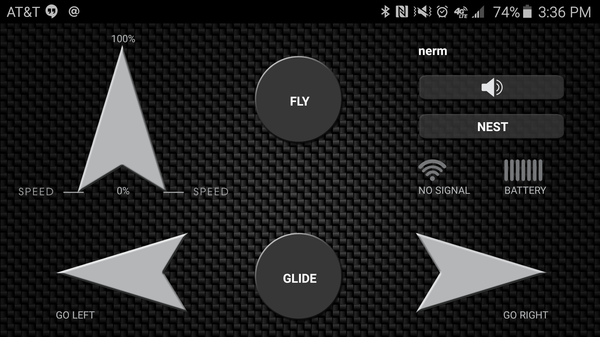 You have to fly it using a free companion app (available for both iOS and Android) running on a smartphone with Bluetooth 4.0. That connection allows for a range of 100 meters, though I rarely took the bird further than a hundred feet away from me. A novice mode allows you to control direction with your phone's gyroscope, though I fly this mostly in the expert mode with directional buttons and precise power control for flapping speed. Surprisingly, I had the most fun flying the Bionic Bird indoors. Like a nano-quadcopter, it's simple to deploy and can't do much damage, even when crashing directly into furniture. Takeoff requires about six feet for the bird to start gaining altitude and fly straight, at which point you can switch to glide mode to get it to gracefully bank. After some practice, I could get it flying a circle in my living room, though I do have 10-ft ceilings. This would be a fun toy to fly in a school gymnasium or empty warehouse, but it's still usable at the office or at home. Outdoors, the bird was more affected by wind than anticipated. Bionic Bird can theoretically fly in 8 mph winds, but I had trouble launching and maintaining control even in a light breeze. Beach-side wind was able to knock the 9 gram toy into the side of my car (where it actually magnetized and stuck to the door!) and in one flight carry the bird to the roof of a neighboring house--getting it back was fun. When flying outdoors, take this to a park with a lot of space, and be prepared to chase it down a bunch while learning and tweaking the wings for balance (with included stickers). But in the moments where the bird flies and glides right, it's a wonderful and satisfying sight. I didn't grow up with the Tim Bird, so I am thoroughly charmed by this toy ornithopter. Its simplicity works to the toy's benefit, but limits its capabilities--Bionic Bird's Indiegogo was unable to raise enough funds to develop stationary flight modes and onboard cameras. You also have to be prepared to completely lose the thing in a wild outdoor flight, which makes the $120 price a little tough to swallow. 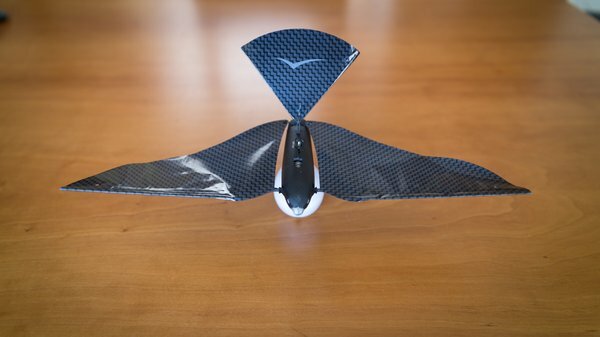 We'll be shooting a Show and Tell video to show off the Bionic Bird's flight in the near future so you can see it in action.